After firefighter Rainn Harris rescues Geneva Carson from being stuck in a tree, she feels she owes him. Helping to care for his autistic niece comes easy, but her attraction to Rainn is a different story. Being drawn to a man twelve years her junior metes internal havoc as Geneva attempts to balance responsibility and personal fulfillment. And the prospect of becoming a middle-aged mom to a special-needs child sends Geneva into a tailspin of conflicting emotions. As the custodial parent for his young niece, Rainn is determined to be a better parent than his absentee sister. When Geneva agrees to help care for Mia, Rainn is overjoyed. He admires Geneva's compassion and enthusiasm for life, and expects she'll be a positive influence on Mia. What he doesn't expect is to fall in love with the beautiful and vital woman. But Geneva's hung up on their age difference, and he must convince her of his sincerity before they will ever have a chance at happiness together. As tension threatens to pull them apart, both must learn to rely on the Lord to direct their futures-whether that means two lives joined or paths in opposite directions. “You will not win without a fight.” Geneva Carson jammed the end of the flashlight into the waistband of her pajama bottoms, and started to climb. Meee-owwwww. The matted, long-haired calico studied Geneva through half-closed lids, looking way down. Its eyes shone like yellow mirrors, caught in the light’s beam. With a blink, it bounded to a higher branch, clearly visible amidst the thinning leaves of fall. “Come on, you silly little thing.” She shook her head. Unbelievable. Talking to a cat instead of getting ready for work. I jumped right in, didn’t I, Lord, without taking the time to ask for help, as usual. She called herself nuts, but it sure was fun to be climbing a tree after so many years. She found her balance on a sturdy limb and continued to climb. What would her daughter say if she saw this fiasco? Moselle would have a fit at such foolishness. Geneva pulled out the flashlight to make sure the quarry remained in sight. “You are not going to keep making that sad racket…And quit climbing higher,” she informed the stray cat. She looked down while attempting to secure the flashlight again. Uh-oh. Oooo, I’ve done it up good this time. Geneva swallowed. A big gulp that got caught somewhere on its way down. Her knees wavered at the realization of just how high she had climbed. She was a good twenty feet off the ground. “Geneva, what in the world are you doing in that tree?” her sister yelled from the back door. I may be fifty years old, but so impetuous I’m high in a tree? “Don’t bother. Call—” The door slammed. The words were seconds out of her mouth when a wail blew from the Platteville Volunteer Fire Station downtown. She scrunched her eyes shut, hoping it was all a wild dream. When she opened them, she got scared. What if I fall? She could find herself in the hospital and where would that leave Frivolities? Her brand-new business would go belly-up. God had presented the idea for the fanciful Frivolities to her and her sister. Geneva was determined to make it work, especially with Lanae battling hepatitis C and Moselle on the brink of marriage. What timing. At the thought of her daughter, Geneva said a subconscious prayer that Moselle’s fiancé, Eric, would be the fireman coming to her rescue. “I assure you, I’m too scared to let go.” Geneva’s voice quivered. But she couldn’t help smiling at her predicament. “Not God, just me.” The firefighter chuckled. She remembered her first look at him. Rainn was several years older than Eric, but they’d become fast friends when they met at University. Geneva may have heard Rainn’s name a time or two before Eric started working on Moselle’s loft, but she hadn’t any reason to pay attention. Since then, she’d seen him with Eric many times. Young, strong, handsome Rainn Harris. Lanae would love being in this situation. Now she’ll tease me until one of us meets our Maker. Geneva braved another sneak peek to discover Rainn wasn’t looking at her. But to his credit, he was trying to hide that half smile that lingered at one corner of his mouth. Enfolded in his arms while the ladder descended, she discovered that she wanted the ride to last. And last. All too soon, the whirring jerked to a gentle halt. Geneva’s feet searched for solid purchase, but her legs didn’t find that foundation at first. Rainn kept her close, half carrying and half leading her over to Lanae, who stood with mouth agape. Before releasing his grasp on Geneva’s arms, Rainn bent to search her face. Thanks to full daylight, he’d get an eye full. Just in time for the whole neighborhood to witness my folly. Me, held in the arms of a man twelve years younger. Disconcerted as usual by his premature gray hair and handsome face, she attempted to meet his gaze head-on. “I’m just fine,” she announced with false bravado. “Guess it’s the cat’s turn, then.” Rainn pivoted and went up the ladder again. She checked out his muscular physique, sighed inside at his strength, and the protective way he had held her against his chest. At full extension, the ladder reached the cat, way too high up the tree for Geneva’s comfort. The cat was quiet in Rainn’s folded arms. She caught herself eyeing the man rather than the cat. Holy macaroni, what is wrong with me? A motor on the fire truck kicked in, and the calico struggled for release. Rainn gave its neck a gentle tap and set it on a low branch. In a calico flash, the cat streaked down the tree and away from the humans. So much for all their efforts. Geneva studied Rainn’s precise movements, and wondered just how hot his extra fire gear had to be—pants and boots and hat. It was hard not to be distracted. “Don’t be so dramatic,” she answered Moselle. “Went after it with gusto, just like you do anything you set your sights on,” Lanae interjected. Geneva pulled out of the hug, and her mouth went dry. Rainn hadn’t worn his turnout coat when he climbed after her. Now she stood mesmerized while he yanked down the suspenders and stepped out of the pants. How long had it been since she’d watched a man step out of his clothes? Way too long. And the clothes this man wore fit him way too fine. Rainn caught her look, noticeably suppressing a grin. She couldn’t will her gaze away. Something huge and dry lodged in her throat. When he headed toward her, she stood riveted in place, unable to break eye contact. She forgot they weren’t alone. Her heart seemed to quit beating along with the breath she held. His warm voice made her feel as secure as she’d been while in the tree with him. “Alrighty, then.” He drew a breath and acted like he wanted to say more, but he focused on the uppermost branches instead. The fire truck started its warning beep for reverse gear. She finally released a huge breath. “No problem.” He stepped back, giving her that same direct look. I’m long past thirty. Isn’t he supposed to respect his elders or something? She remembered she was standing there in broad daylight, wearing her sheer lace cami. The intense heat of embarrassment slammed into her. She’d worn pajamas in public when she was young, but thanks to gravity, the bumps and lumps revealed in day’s light called for retreat. Now! He held her gaze a couple heartbeats longer. Then he shot her a full grin that spread radiating lines from eyes and mouth. That smile erased the lack of sleep caused by the cat. Geneva grinned back and basked in the idea that Rainn treated her as an attractive woman. He must like her cami. But he’d been a gentleman and kept his gaze on her face. She sucked in her gut and stood so erect her shoulder blades almost touched. Not that Rainn Harris would stay in Platteville long. He’d only recently arrived, and once the stained glass restoration for the church windows was done, he’d be gone. She heaved another sigh; blew it out with resignation, before turning back to the reality of life. Rainn. There had to be an interesting story behind such a name. All femininity rushed to the forefront when she again recalled their proximity in the tree. Lord, help me focus here, please. I don’t have time to notice a good lookin’ guy like Rainn. I have to concentrate on Frivolities! 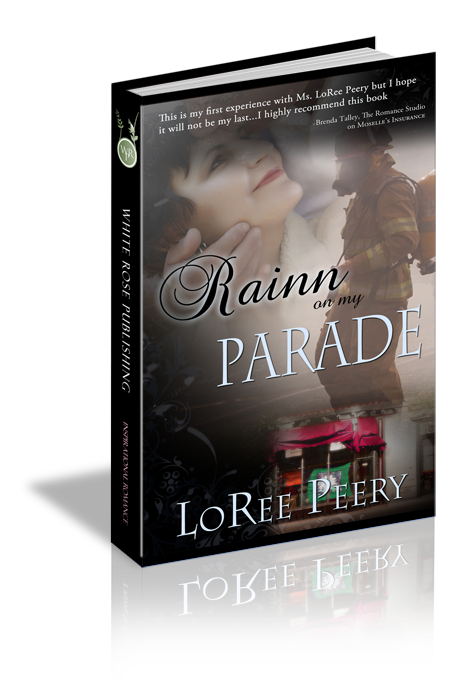 Geneva reminded herself of what she and Lanae repeatedly told Moselle: “It’s what’s inside a man that counts, not his physique.” But in Rainn’s case, a fine form added to the mix. The best thing? Rainn believed in God. Good grief, what’s going on here, the way I reacted to him. Shouldn’t I be long past those feelings? Sorry, Lord. Help me focus on Frivolities. Now that she’d been held in his strong-as-a-tree-limb arms and against his solid chest, how would she be able to concentrate on merchandise and Frivolities customers? Moselle had her back to Geneva, cell phone to ear, trudging off to her loft above the store. “Shame on you,” Lanae chided. But the twinkle in her sister’s eye gave her away. They wrapped their arms around each other. “Too bad I’m not ten years younger,” they said in tandem. And then they shared a hearty laugh. Rainn slapped the air in the direction of the alarm, simultaneously attempting to surface from his dream. It’d been a good one, too. His arms had been full of warm, soft, fragrant woman. Geneva Carson. The ringing persisted. Not the alarm. Wide awake now, Rainn swiped his fingernails down his shirt front. “Wait. Lindsay’s gone and left Mia with you?” No way should his autistic niece be alone. Q1. Geneva got hung up on the age thing when Rainn came into her life. Have you ever found yourself caught up and obsessing on an issue when your focus should have remained on the Lord? Q2. As much as she was drawn to the autistic girl, Geneva viewed Mia as a bit of a problem, interfering with the business of Frivolities. Has someone come into your life and your looked on that connection as a problem rather than an opportunity? Q3. Geneva spent her life serving, and then on her business. She thought busyness was the way she should live, instead of simply living because she was free in Christ. Have you ever thought that way about tasks, making them a duty instead of a pleasure; or have you been thankful to just be alive? Q4. Geneva struggled with projecting her relationship with her deceased husband onto Rainn. Have you ever taken something bad from an earlier experience and expected the same results from a new one? Q5. After his sister's body was discovered, Rainn dealt with guilt over the idea that he had always thought he'd be a better parent. Sibling disputes and attitudes are normal. Do you have any issue from early adulthood clouding your relationship with a brother or sister? Q6. One of the issues of this story is the age difference. An older man scenerio is more common than an older woman. In either case, have you ever been judgmental of such a situation?